Developers are submitting plans for a new high-speed line to the UK’s Department for Transport (DfT) in response to a call for market-led proposals. 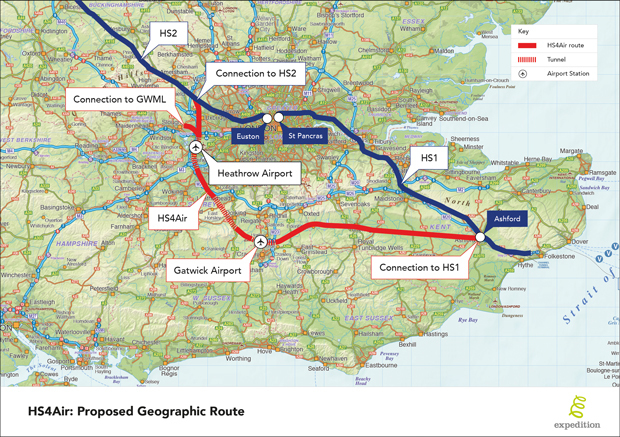 Named ‘HS4Air’, the proposed £10 billion railway will connect HS1 at Ashford to HS2 North West of London with stops at Heathrow and Gatwick airports and a spur connection to the Great Western main line. This map from Expedition Engineering shows the route. To minimise environmental disruption, the following should be noted. There is a North-South tunnel under Heathrow Airport. HS4Air follows the M25 to the South-West of London. Several miles of the route between Heathrow and Gatwick is in tunnel to the West of Horsham. There is a West-East tunnel under Gatwick Airport. The Ashford to Tonbridge Line would become part of HS4Air. There will also be stations at Ashford, Tonbridge, Gatwick and Heathrow. This further diagram from Expedition Engineering shows the various possible routes. Note the following about HS4Air. Four major airports; Gatwick, Heathrow, Birmingham and Manchester, will be connected to the Channel Tunnel. Wikipedia suggests, that the line could be extended to a reopened Manston Airport. A Paris to Manchester passenger service via Gatwick, Heathrow and Birmingham, is proposed. High-speed connecting services from Cardiff, Oxford and Manchester to Ashford are proposed. HS2’s major interchanges of Birmingham International and Crewe, are served. Freight routes from Liverpool and Southampton to the Channel Tunnel will be enabled. It looks a good basis to connect the rest of the UK to the services through the Channel Tunnel. The article also gives some sample journey times. Intriguingly, the Manchester-Paris time, is the same as Eurostar’s current time between London and Amsterdam. The plan seems to be well-thought out and it gives a good increase in connectivity from Wales, the West Country and the Midlands and North of England to Heathrow, Gatwick and the Channel Tunnel. But I can see a few problems. Will the residents of the North Downs accept a high-speed railway through their area? If freight routes from Liverpool and Southampton to the Channel Tunnel are established, will residents object to masses of noisy freight trains? Will there be pressure for more tunnels? On the other hand Expedition Engineering are saying that needed extensions to the UK’s electricity grid can be laid underground along the same route. sadly jobsworths in the Home Office and HMC&E (now HMRC) would never agree to carry out routine formalities on the trains, so one has to change terminals at London, waste and hour to clear customs, security and immigration and the same on the way back. Consequently despite every desire to do so I have never travelled through the chunnel. it’s not just the bureaucracy. Twenty years ago there were no budget airlines. I live in Chester and did once use the Chunnel to go to Paris, shortly after it opened – taking an early morning train from C I was in P for early afternoon. Nowadays, easyJet’s MAN-CDG service is 1 hr 30 and likely to be cheaper than any rail services. Rail can compete on distances like London-Paris but the further you go from London and Paris, the less attractive even high-speed trains become. Off-season, Ryanair will fly me to the Med for less than it costs to get to the airport. Surely, there are a lot of far simpler and more profitable alternatives to the hs4 you suggest. I think a lot more people use Heathrow than the channel tunnel and therefore a focus on connecting domestic cities and airports should come first, with some international rail services running from the major cities. As its unlikely we’ll join the schengen area, those cities can have dedicated international platforms with passport control. Apologies if you’ve already discussed the reasons this wouldn’t work. -Link HS1 and HS2 services through the largely existing Camden Road link (widened to 4 tracks, new overground Station) and bring Stratford International back into use for Manchester/Birmingham/Leeds > Old Oak Common/Stratford > Europe direct international services (no domestic journeys within that). -Provide a dedicated direct route from the Byfleet Junction to the Heathrow T5 station (to avoid level crossings), then use an electrified North Downs line to provide a Gatwick > Redhill > Guildford > Woking > Heathrow route. It isn’t ideal, with the reverse at Redhill and all, but would still save journey time vs the bus in traffic or train through Central, and would provide links between the South West and both airports. – This Byfleet-Heathrow line could be extended to create high speed domestic services from Portsmouth/Southampton/Bristol to Birmingham and beyond via Heathrow and HS2. Would probably need an upgrade to the whole SWML, especially given that it uses third rail and high speed lines probably need overhead power. -Run stopping services from Heathrow T5 to Waterloo via Staines and Clapham Junction to further improve connectivity of Heathrow and provide a cheaper alternative to the Express/Connect (as Gatwick has). -This would allow all South West and Western cities to be linked to the high speed network via one change at OOC and create a profitable route between Gatwick and Heathrow. Southern cities can access it via local services to Ashford Intl. Northern Cities can run direct international services. Personally I’d add a stop at Aylesbury (international) to serve Oxford and Milton Keynes. Would also serve towns from Bristol to Cambridge with the new varsity line. I was reporting on the HS4Air scheme, which appears to be well-thought out, although there will be a lot of resistance to it. Linking HS1 to HS2 is not possible as it would cut the North London Line during building and trains would have to crawl through. The simplest HS1 to HS2 is probably to build a Crossrail station at Old Oak Common to connect to HS2 and extend Crossrail to Ebbsfleet to connect to HS1. 1. Old Oak Common is being designed, if not under construction. 2. Old Oak Common connects HS2 to the City, Canary Wharf, Oxford Street and Heathrow. 3. Old Oak Common will connect using the West London Line to all points South. 4. St. Pancras is getting too small and extra terminal platforms could be built at Ebbsfleet. Please excuse my ignorance, but what exactly is the track between South Hampsted and the St Pancras Eurostar Portal being used for at the moment? Can’t Camden Road be remodelled with two through tracks to the south and two platforms on the north disused part, with Overground and High Speed kept separate, so that trains can pass through to HS1? Granted, it would be slow through this section, but still much faster than arriving in London and changing trains. Even a tunnel through north London would be shorter and cheaper than the Surrey Tunnels suggested. Agree that running crossrail to services to Ebbsfleet would be a good idea. Stopping some Eurostar’s at Stratford could achieve the same thing. But for international travelers coming from Birmingham or Manchester, it stops becoming worthwhile to get the train to Europe if you have to change several times through London. 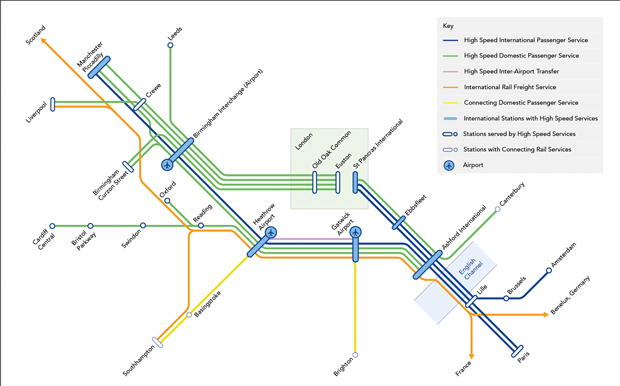 the Byfleet-LHR and LHR-Waterloo connections are precisely what’s proposed by HSR https://heathrowrail.com/service-opportunities/. As this would be privately funded, ISTM quite likely to be approved before too long.